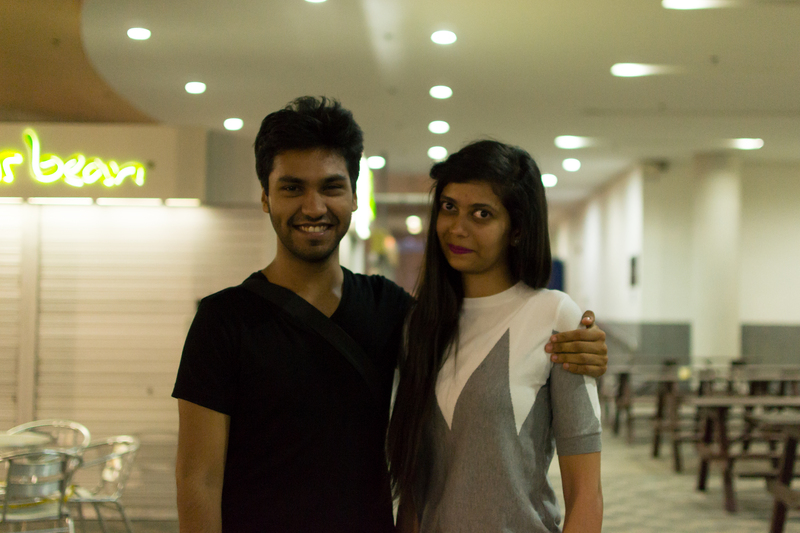 Shitij and Arti, the creators of Humans of Singapore! After hours of navigating around Singapore’s city-centre on a humid Thursday evening, we were joined by Shitij and Arti with the one question on our minds finally answered: Who exactly are the “humans” behind Humans of Singapore (HoS)? Established in 2013 and modelled after the Humans of New York Facebook Page, HoS has shared numerous stories about the ordinary Singaporean. With 73,767 likes and counting, the page has gained its fair share of attention with humbling, inspirational stories from the average Singaporean. In lieu of their exhibition from the 15th to 17th of May, Raffles Press is here to help you learn more about the people, workings, and motivations behind HoS, along with some insight into their exhibition at the Nanyang Academy of Fine Arts (NAFA). Press: Could you tell us more about yourselves? Shitij (S): My name’s Shitij. It’s spelled S-H-I-T-I-J but people usually remember the first four letters of my name best– it’s always easier. I came to Singapore in 2008 to do my undergraduate degree at Singapore Management University, and I started working in Singapore four years after my graduation, but about one year into the job I decided that I was bored. My friend then made a joke saying “Why don’t I start Humans of New York for Singapore”, and that was how HoS was born. I had no big epiphany; a joke had spawned the entire project. So it started in January 2013, and it’s been about two years. This is Arti. She’s the second-at-hand and she helps to take all the rest of the pictures. Arti (A): I came to Singapore five and a half years ago to study. I studied in Lasalle and I took Communications, Design, and Advertising. Photography was always a part of my life and it was never something that I needed a reason to pick up. My dad used to be a photographer so I grew up with his influence, surrounded by cameras and all. After school, I left off from photography because I started working, and that is what work does to you – it makes you give up what you truly love. I was working at an advertising agency, and after a year I started hating myself because my life gradually became something that had nothing to do with painting or pictures. Up until my second year in Lasalle, I used to paint one painting daily, and take pictures every month, and do all these things I loved. But during that one year of work, 365 days of my life was deprived of paintings and books. So I felt horrible, which was why I started getting in touch with him (Shitiji: I kept putting it off until a year later). In the year that he delayed replying back, I was miserable. Shitiji: Sorry, I was super lazy when it came to following up on her request. She kept asking if there was anything that she could help with. This is how it all happened: basically I ran into her one day and the next day she was like: Do you need help with Humans of Singapore blah blah blah. Arti: Before that he had posted my picture on Humans of Singapore once! Shitiji: Then a year later she was still asking and one day I was just: yeah, let’s meet. Since then she’s been pretty good. Press: How do you balance your work life and HoS? Has managing the page has become a recreational activity? S: We dedicate our weekends to interviewing and photographing people for HoS, and work on regular workdays. As for whether HoS is a recreational activity: Yeah, kind of. It is a glorified hobby, in my view. It started out as a nice past-time, then it became a hobby, then a glorified hobby. A: Now we’ve become used to doing it. To me, every Saturday is now like a Humans of Singapore day. It has become some sort of a routine. Press: How does HoS work? Do you just go onto the streets to start interviewing people? If they say yes, then we take a picture, we show it to them, and then we tell them, “Before you run off, I’ll quickly explain the project. What I do is, first I ask for a picture, then it’s followed by a deep, insightful conversation for five minutes. So do you guys have five minutes?” And usually people do have five minutes. Once they say yes, I just pepper them with questions. Usually I don’t ask them what they do or where they’re from, unless they feel really comfortable. I go straight to the questions, and based on their responses I dig deeper. So if I ask “What was the happiest moment of your life”, normally people would say something like “When my child was born” and so on. But then I ask what made it the happiest moment of their life, and then you tend to get a more flavoured response. That’s pretty much the process for the other team members as well. So they have tuned it a little to their own tastes, but roughly speaking that’s what we do. Press: Was it easy to get such thought-provoking answers from the beginning? S: For the questions, I already had a set of ideas from Humans of New York, because he has asked a lot. I just took those ideas, and thought, let’s try and apply those to Singaporeans and see what happens. And those questions didn’t run out. The question was more of how to approach people, what sort of body language I should have. When I first started, I would be like “Hi, um, would you mind if, um, I take a picture of you, uh…”. There was a lot of skepticism coming from yourself, and that reflects in your body language, and that’s why people are uncomfortable. But over time I started becoming more comfortable. The moment my body language changed, the responses of people changed as well. So the moment I started becoming more confident, people started responding better. And I guess that was the process. Which is weird, because some of the other people on the team have been super comfortable from day one. I took a lot of time, but those guys, as soon as they got in, were like, done. They were super easy about it. So it depends. I took some time, other people didn’t take as much time. A: I think it happens when you ask the person the right question. Yes, a lot of people like talking and a lot of people don’t; I usually don’t like talking, and it is ironic that I do this, but when somebody talks to me about photography or some other things that I like, I will often strike up a conversation with them. So I think it is about the direction of the conversation and how to hit the right spot. Press: What was your most memorable encounter? S: The one with Fel stands out, because it wasn’t just her story: it was the fact that we kept in touch after that as well. First was the story: she’s a single mother running a business of luxury jewelry, which I thought was pretty interesting. Secondly, it got an amazing response. Thirdly, once she herself saw the response, she was very happy about it and she communicated with me and said “Thanks a lot, I had a lot of sales”. I could literally see the impact of the post going viral on her business. That is something that I like. Later on she met me, and we discussed how it was affecting her business and so on. Then every time someone comes to me for stories, I’ll just refer to [her] as well because she’s one I can see deserves a lot of help. That’s why it remains the most memorable encounter for me, because firstly, she’s very responsive. And secondly because you can actually see the benefit, you can actually see it happening. It happens for a lot of other businesses I’ve covered as well, and it’s not for profit or anything. The picture of Fel’s story (link to her story above) that helped HoS attain a spike in their viewership. A: For me, it had to be an encounter with this Filipino lady who had been living in Singapore for ten to fifteen years. She was a single mum, and she felt quite strange about her relationship with her son, because of how he was distancing himself from her– he was around thirteen, or fourteen. You know, that’s how teenagers are all the time. Then when the HoS talked it out with her, she said, “Last summer, this happened and now I feel like I’m closer to him…” It was one of those stories where she realised halfway through the conversation that she was not that bad a mum, and she should be proud of herself, because she had always doubted herself. To me, that conversation helped her to realise that she was doing a good job. Press: So is the impact you’re making on the lives of these people what keeps you going? S: Pretty much. It’s two-sided; I go out and take pictures, and I see the response. So you can take pictures, but you can only do that for so long before you want to receive some sort of recognition. You want to see that people are actually seeing this, and discussing this. Even if it’s a negative reaction, I don’t really mind, as long as there’s some discussion around it. I want that to happen. The follow-up on the pictures is what keeps me going. A: I think Shitij looks at it more in terms of what you can do after taking the picture and how people can help. For me, maybe because I haven’t spent as much time [working on the page], it revolves more around the experience when I talk to people, and the impact it has on them. A lot of times, people just tell us something really emotional: deep dark secrets which I wouldn’t myself tell strangers. It’s kind of surprising. But every time they say it, it just makes it feel like they just had to get it out. Whenever that happens, I feel like, “Oh, at least I’ve helped him talk it out”. That makes us feel like it’s helping them in some way. Press: Do you think there is a certain way Singaporeans stand out amongst the responses, in contrast to Humans of New York or Paris? S: That is a good question. I never really thought about this that much. I guess it has less to do with the pictures themselves and more to do with the responses to the pictures, in my opinion. Because I’m sure that if Humans of New York came here, they will get similar responses from New Yorkers. It is more to do with what people respond to. So my view is that Singaporeans tend to respond a lot more to the underdog stories and things that are out of ordinary and not usually seen in the normal perspective. For example, when you talk to a student from SMU, they might talk about jobs, but that doesn’t necessarily stand out because they are things we Singaporeans are familiar with. So something which they haven’t heard before, something super out of ordinary, would get a response. For example. the lady at Changi airport whose story we posted a few days ago– the cleaner– that is something that people don’t usually hear about and talk about, and that’s what people around here respond more to. Whereas if I make a comparison to Humans of New York, I would say that on average, people respond to every story. A: I don’t think it’s every story, although they do respond more to everyday situations. So there was this one story that stuck with me, I don’t even know why! It was basically this little baby in a stroller with his dad and the caption was something like: “We woke up today at 5 and we are sorry.” That’s something that is so usual. It’s not about underdogs, not particularly outstanding, and I am sure a lot of people do that. But you know, it’s just so sweet and nice and relatable. Those kind of things don’t get picked up here as much. perhaps because people are just looking for more out of ordinary content not commonly covered in the news. Maybe it has something to do with the whole Singapore media scene- they don’t report a lot of stories about poverty or cleaners. So people turn to social media or pages like Humans of New York that cover things that are not in the paper. Maybe it’s that. Press: Tell us more about your exhibition! S: NAFA has a course on art curation and they approached us to ask if they could curate some of our pictures and use them as part of the exhibition. That was how the whole process started. They are trying to select 15 to 16 extraordinary stories and showcase them. On our part, we are trying to bring this project to offline mediums and see how people will react. It’s from the 15th-20th of May, and it is a walk-in exhibition of sorts. Unfortunately, I won’t be there as I have to fly to Hong Kong but Arti will be there. There will be both her pictures and my pictures. The poster for HoS’ exhibition at NAFA, do check it out for exclusive stories and photos! Our conversation ended here, with a casual chat about our personal lives after this point. Clearly, Shitij and Arti have left us with a great deal of wisdom: the true value of each person’s stories. Through their work, they’ve spread joy, shared times of struggles, positively impacted the lives of many, and provided a listening ear for those in need of one– all out of sincere passion for their craft. Humans of Singapore will be holding their exhibition at NAFA Campus 2 on the 16th and 17th of May. Do visit their page for more insights into the lives of everyday Singaporeans, or to show them some appreciation for the work Shitij and Arti have put into sharing each one of these stories! Great read that inspired me to continue working on HumansOfRJC!